BLACK CABLE TIES. Buy quality Auto and Marine Electric Parts and Accessories online, Sydney. 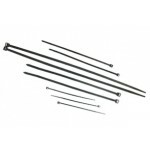 Black Cable Ties are UV and Weather Resistant. Quality ties, safe for outdoor use. CT-150W-3C Black UV cable ties 150mm x 3.6mm Supplied: Bag of 100 pieces..
CT-200W-2C Black UV cable ties 200mm x 2.5mm (narrow) Supplied: Bag of 100 pieces..
CT-200W-4C Black UV cable ties 200mm x 4.8mm Supplied: Bag of 100 pieces..
CT-200W-7C Black UV cable ties 200mm x 7.6mm (heavy duty) Supplied: Bag of 100 pieces..
CT-300W-4C Black UV cable ties300mm x 4.8mm Supplied: Bag of 100 pieces..
CT-300W-7C Black UV cable ties300mm x 7.6mm (heavy duty) Supplied: Bag of 100 pieces..
CT-370W-4C Black UV cable ties370mm x 4.8mm Supplied: Bag of 100 pieces..
CT-380W-7C Black UV cable ties (Heavy Duty)380mm x 7.6mm Supplied: Bag of 100 pieces..